Is your child emotionally sensitive and slightly overwhelmed by the school learning environment? Does your child require an educator or education environment which holistically supports their emotional sensitivity? Is your child labelled ‘shy’, ‘introverted’, ‘misunderstood’ or even ‘disruptive’? Does your child become over stimulated and agitated by busy surroundings, preferring a calmer, relaxing, more sedate learning environment, supportive of their emotional needs? 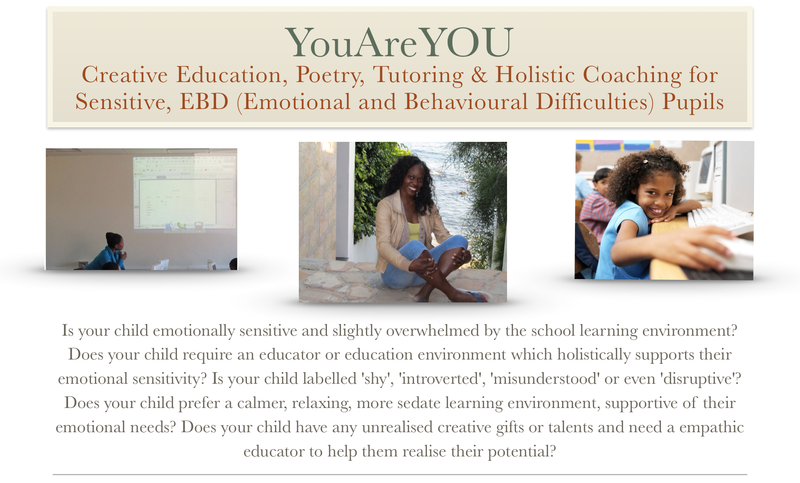 Does your child have any unrealised creative gifts or talents and need a empathic educator to help them realise their potential? Patricia prides herself on the fact she has worked with young people from diverse backgrounds and with a wide range of learning abilities. She is renowned for her very empathic, patient and intuitive approach to educating and promotes creative education as a tool for healing and emotional well being within a young person. She is also Sable Litmag Poet-in-Residence, an Award-winning internationally published poet, writer, performer, trained actress and dancer, who has toured the UK, parts of Europe and Chicago. and will happily come to your home/is available for home centered tuition. Can also provide tuition via Skype for local and international pupils.